Here are some of the greetings and dedications our choir has received via its website. These are heartfelt expressions from people who hold great affection for the choir. Biotz Alai, people with a happy heart who get together to sing. They need to do it. More than just ordinary fans of music. They manage the harsh discipline of rehearsals, and even when they do it well, they still want to do it better. It is because of this attitude that voices like those of the Ariños, Solaun and the Zubizarretas have emerged within the Biotz Alai, better than those of simple amateurs. May the happy heart keep beating a long time yet. Only a fen times have i felt the closeness of a group or the emotion that the music has brought upon me. I experience all this whenever i listen to the coro Biotz Alai, and then i realize that many people around me share the same feelings. It is because of this, and home village that yoll enjoy all favours from both the male and female inhabitants of Algorta and from all us. 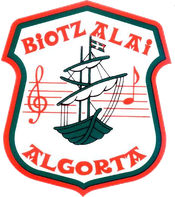 It is han honour to Bizkaia to count on an institution such as Biotz Alai choir from Algorta. For many years yoll and your predeccessors have been the best ambassadors of the music of Bizkaia all over the wordl, as well as of its culture, traditions and good habits of our people. I must thank you for all this task in the name of Diputation Foral de Bizkaia, especially as it becomes a reference across the borders on this web page. If music gives noble feelings to the people, coro Biotz Alai carries us into that world of feelings, anecdotes and memories which cheer our spirits and relieve our stress. nent members. This has helped me to meet and get to know a lot of people and families throughout the years i have spent in Algorta. The care and love they bestowed me has been like a soothing balm hany times. I hale never felt so moved as i have been with the sones y yoll sung with your wonderful virile voices. Yoll have never let me down, whenever i needed you, you always stood by me, wherever it was.